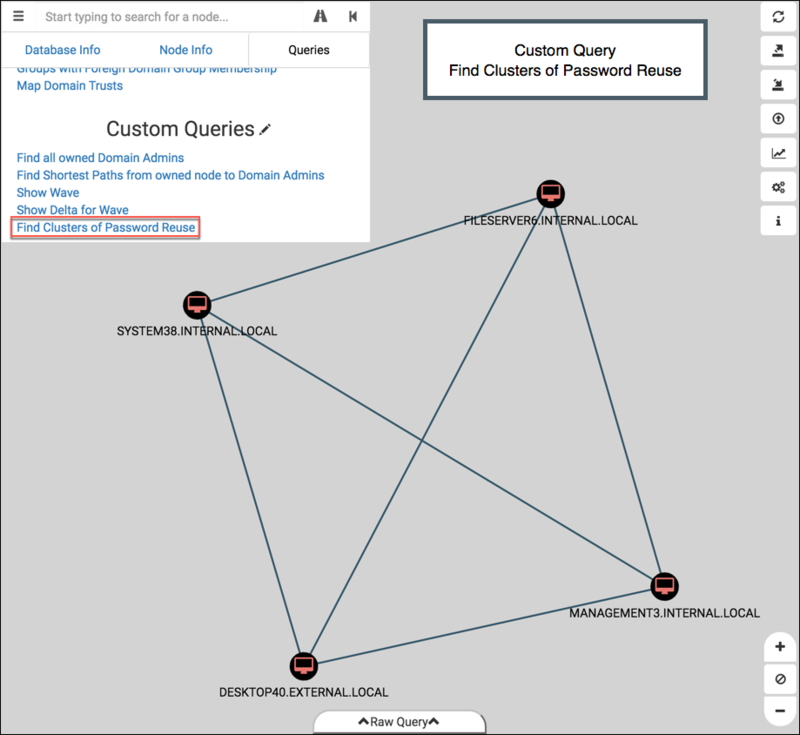 How to integrate password reuse attacks into BloodHound with the 'SharesPasswordWith' relationship. Includes a new Custom Query, API response logic parsing, detailed query output, and more. My workflow during a penetration test leverages some non-Active Directory techniques, as I’d imagine most pen testers’ would. One of the first actions I take after compromising a system is to dump the hashes of the local accounts. We often find that those accounts exist on other machines in the environment with the exact same password. It’s a common technique for lateral movement and it’s highly effective. Marina Simakov and Tal Be’ery delivered a great presentation at BlueHat IL 2017 that dives deeper into the risks associated with local accounts. I encourage you to check it out here. However, lateral movement like this is not something that’s guaranteed to work by just inspecting users and attributes – granted you can get a pretty good idea by comparing PwdLastSet dates. Local accounts aren’t necessarily backed by a centralized configuration overlord like Active Directory, so each machine’s local RID 500 account isn’t guaranteed to have the same password or username. Heck, it’s not even guaranteed to be active. Maybe the admins disabled “Administrator” and created “corp_adm” with RID 1000 as the new local admin. Lucky for us red teamers, many Domain Admins haven’t adopted LAPS yet, so they instead manually set the password for the local admin account (or even worse, use GPP to set it.) And they set that same password on several machines. Where else do we see commonly see passwords being reused? Users with multiple accounts. For example, Bob may have a normal, everyday account (INTERNAL\bob) and a privileged account for administrator-level tasks (INTERNAL\bob_admin). Or perhaps Bob has an account on two different domains (INTERNAL\bob and EXTERNAL\bob). Bob doesn’t like the hassle of remembering two different passwords, so he sets the same password for each account. That’s a bad Bob. Abusing password reuse between separate accounts is a useful technique for expanding access across the network, but it’s something that BloodHound didn’t have a representation for quite yet. 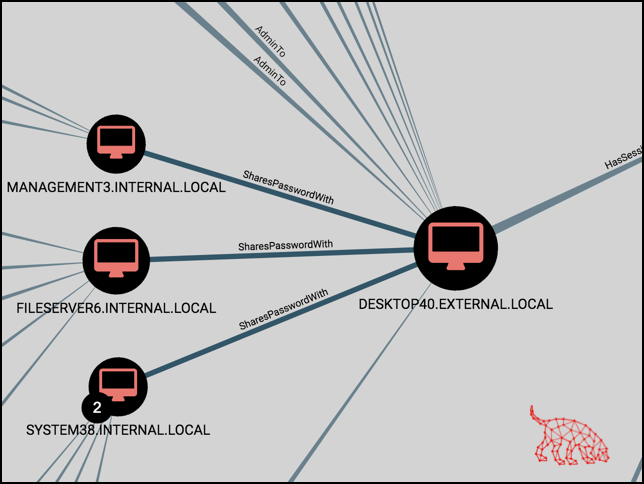 No fault of BloodHound – its data collection script isn’t designed to test for reused passwords, and that’s a sensible approach given the inherit risks of doing so without human oversight. However this knowledge is valuable information for our attack graph, so I created a means to integrate this into BloodHound via a new relationship. The first point would cover common local administrator passwords on Computers. The second point would cover Users reusing the same password for multiple accounts. 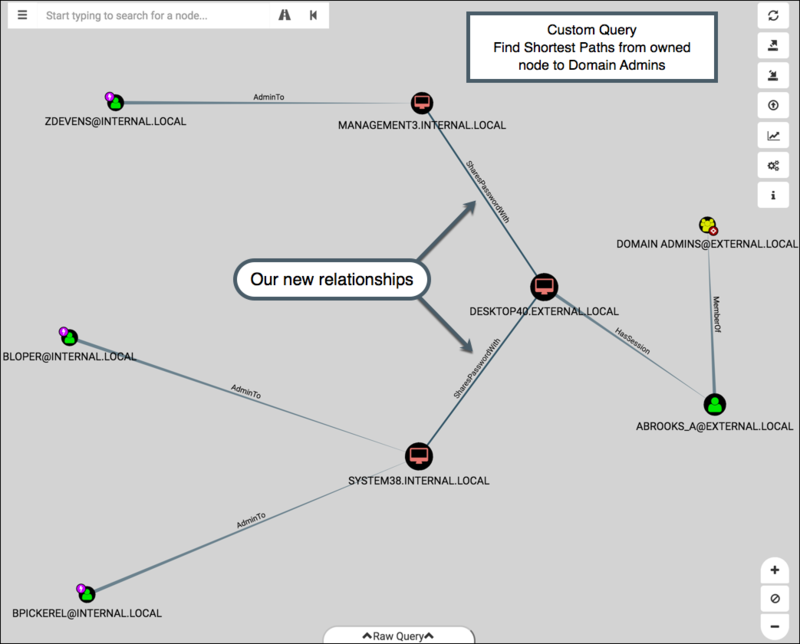 Neo4j doesn’t support bidirectional relationships, however we can make a unidirectional relationship in both directions. We architect it this way to allow paths in either direction for escalation. Don’t worry, Neo4j is smart enough to avoid cycles and to calculate shortest paths despite this configuration. The use of CREATE UNIQUE guarantees that we don’t create duplicate relationships between nodes, so there’s no harm in attempting to re-add the same relationship multiple times. The file passed to -s should be newline-delimited with one node name per line. All nodes listed in the file will have a ‘SharesPasswordWith’ relationship created between them, essentially creating a small mesh network of relationships. You can replicate this by adding the first 3 waves in the example-files directory via -a, and then adding the common-local-admins.txt file via -s.
The graph can become a little hard to interpret when working with a high volume of nodes. I think a future enhancement will be to add a third layout type (joining Directed and Hierarchical) that shows a radial graph output for this query. Doing so will require updating the BloodHound source and learning more about Linkurious and Sigma. The latest code pushed to the repo contained a couple of smaller additions worth noting. Getting this granularity of detail in the API response required some Cypher expression hacks (shown here), probably better suited for a different blog post. I plan to write about it next week. We see above that two nodes were marked as owned for wave 2. After finding the spread of compromise, we found 5 additional nodes in the wave. I’ll post updates here and on Twitter via @porterhau5 as I continue to tinker with ideas. Please reach out if you want to explore some of these together! I’d really appreciate some help from those of you who are skilled with front-end development :D Feedback in any form is always welcome. Interrogate Computers for list of local, non-AD admin accounts. Add those accounts to database as User nodes with AdminTo corresponding Computer. Instead of running custom queries through the Queries tab, have a slider on the main dashboard that can step through waves. Define a “Critical Path to Compromise” (CPTC): the exact path taken through the network to go from A to Z. Add property to nodes indicating their involvement in the CPTC. Write custom query to show this path specifically and filter out the rest of the noise. Mostly useful for presenting/explaining to client. Add more options when a node is right-clicked. For example, “Shortest Paths from Here”, “Add to wave X”, or “Created SharesPasswordWith relationship to node X”. Make “Owned in Wave” and “Owned via Method” values fillable from the UI. Ditch the need for an external script to ingest data. General query optimizations to help with scalability & speed. The graphs can get a little messy when a DA account is obtained.